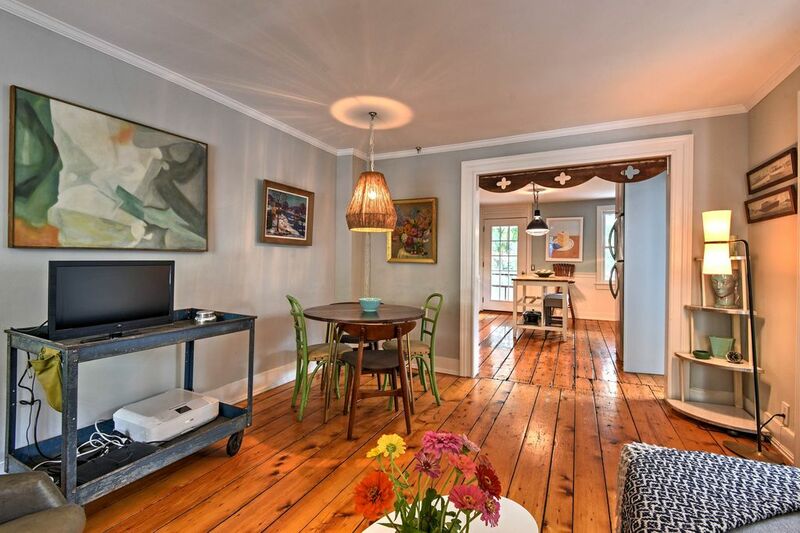 Make the most of your next Northeastern escape by booking this newly remodeled vacation rental, situated in downtown Lambertville just steps from the Delaware River. This historic 2 bedroom, 1 bath for 5 guests is complete with all the comforts of home, including a Smart TV with cable, spacious porch, grill area and 2 bicycles for guest use. Enjoy easy access to all the main attractions, bars and restaurants, New Hope and the Delaware & Raritan Canal Tow State Park Trail. Drive through downtown Lambertville, home to an indefinable spirit experienced only by those who walk its streets. Approach your recently renovated home-away-from-home, beholding a vintage mid 1800's architectural design and well-kept landscaping. Relax on the cozy front porch, where you're sure to enjoy morning cups of coffee or evening cocktails as you listen to the muffled sounds of the historic town center just 1 block away. Upon entering the property, you'll be impressed by the charming interior, which blends eclectic decor with modern furnishings and large windows that illuminate the hardwood flooring. Settle down with your loved ones and turn on the Smart TV with cable. Kick off your vacation with a cookout on the back patio surrounded by an immense yard. While the steaks are sizzling on the gas grill, prepare a few sides in the fully equipped kitchen boasting stainless steel appliances. If you don't feel like exploring all that Lambertville and New Hope nightlife has to offer, get revitalizing rest in the master bedroom outfitted with a queen bed. The others can enjoy nights of peaceful sleep from the additional full and daybed. Perhaps the best feature of this spectacular residence is its unbeatable location, situated just 1 block from the historic town center of Lambertville and just a 10-minute walk to downtown New Hope. Stroll just a few minutes from home to try local eateries, like More Than Q BBQ, Caffe Galleria, Karla's Restaurant, Marhaba, and The Swan Hotel, before grabbing a cold beverage at The Dubliner on the Delaware, The Boat House, or The End of the Hall. Hop on the 2 bicycles provided and go for a ride along the Delaware & Raritan Canal Tow State Park Trail or cruise over to Peddler's Village to explore the quaint shopping town with boutiques, galleries, and restaurants galore! Be sure to discover the Golden Nugget Antique Flea Market, open Wednesday, Saturday and Sunday, where you'll find a variety of antiques at a reasonable price! - Amenities include a fully equipped kitchen with stainless steel appliances, free WiFi, a flat-screen Smart TV with cable, a furnished porch, back patio and gas grill, an enormous yard, air conditioning, central heating, plenty of parking on the 2-acre property and more! - Excellent Lambertville, New Jersey Location - 1 block from the historic town center and just a 10-minute walk to downtown New Hope! Easy access to the Delaware & Raritan Canal Tow State Park Trail along the Delaware River, a plethora of restaurants and bars, shopping malls, flea markets and much more! A real “home away from home”. The thoughtful amenities included in this cozy home comfortable and welcoming. We hope we can return someday. We had a great time and Cynthia was so nice. She had greeted us with a nice bottle of wine and some homemade bread. The beds were super comfortable and the location was so great. The boys took a bike ride to New Hope and did some shopping. It was a great trip. Thank you! My family and I really enjoyed our weekend in Lambertville. The house was so cute and welcoming! I think it was even nicer than the photos! The (I'm assuming original) floors are amazing! I've never seen a copper gutter - it was really neat! The house had many thoughtful amenities left for us like coffee, homemade banana bread (delish!) and toiletries. The master bed was very comfy. The 2nd bedroom easily fit the two pack and plays that we brought. The location can't be beat! We didn't use our car until we left! Our toddlers enjoyed Thomas day at the library around the corner, and the Children's museum across the river. Mom and dad enjoyed cocktails and food around town! We had plenty to do even on a snowy weekend. We definitely plan on coming back in the warmer months. The owner got in touch with me beforehand by text and was extremely easy to communicate with. Thank you again! This is such a wonderful, lovely place. It was comfortable for our family of 3 for a long weekend. The beds were delightful - we took pictures of the tags on the linens and covers so we can find them for ourselves. The host was really welcoming and made sure that we didn't need to run out to get anything after arriving in the evening - we had enough provisions to get us through the morning. Really good communication, really wonderful location, and we can't wait to go back again. Nice weekend getaway. Clean and comfortable. Great kitchen. Off street parking space was a nice added bonus. Walkable to many great restaurants. Would return. Adorable spot! Immaculate, amazing decor! We had an absolutely wonderful girls’ weekend. The house was gorgeous, so tasteful, with thoughtful touches. We came in late on a Friday to wine and banana bread waiting for us and the lights left on! There was even water waiting until the coffee pot the next morning. The coffee and accompaniments were totally appreciated. It was literally the perfect spot. Can’t wait to go back!